The AirGun Centre was established in 1978, and has almost four decades' worth of experience in serving the air gun community. Based in Rayleigh, Essex, visitors old and new are guaranteed a warm welcome and high quality service from expert, knowledgeable staff. With a group of dedicated, long-term employees, the store is renowned as one of the UK's finest in its field. The AirGun Centre supplies a huge range of air guns and every possible accessory, and is an official stockist for many major manufacturers, including Air Arms, Daystate, FX Airguns, Weihrauch and BSA. The store operates a part-exchange policy, allowing you to swap your older equipment for the latest, state-of-the-art guns and equipment. The business is firmly committed to sourcing the latest innovations for its customers – if it’s not immediately available in-store, they will order it for you, and also advise you of the best products to fit your individual needs. The store will also purchase your old equipment at the best possible price, with no hassle. Aside from the comprehensive range of rifles in stock, the AirGun Centre offers a huge array of accessories and equipment. This includes cases, sights and scopes, targets, cleaning and maintenance products, range finders and filling equipment. Night scopes and binoculars are also offered, along with bipods and rests, tactical kit and new products from the world’s leading air gun manufacturers and suppliers. 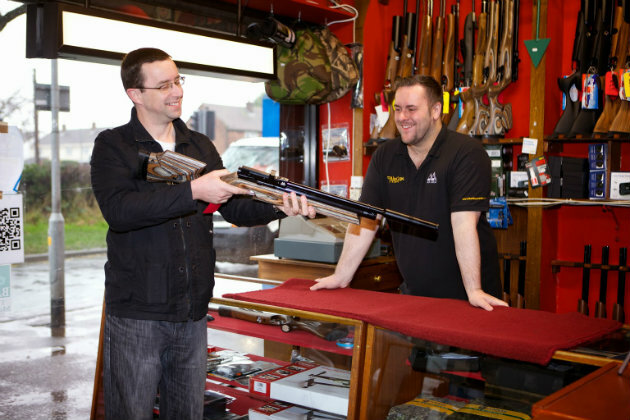 One of the AirGun Centre’s major benefits is its superb after-sales service and support. The store offers free servicing and repair to all its customers, with a lifetime guarantee for parts. Should you need to return a piece of defective equipment to the store, or require any checks to be made, this will be done at no cost whatsoever to the customer. This pledge has been in place for more than 30 years, and covers all parts and labour costs for any service or repair required. The Centre also offers a comprehensive testing service prior to the sale of any rifle, with a detailed test certificate provided free of charge. The company’s website The AirGun Centre offers a great online shop, with comprehensive details of each piece of equipment, alongside user guides, instruction manuals, videos and much more. The store is also the first in the UK to offer air gun finance, with a wide range of short and longer-term payment options.